In a move that had been anticipated for well over a year, the Reds finally traded Jay Bruce. Unlike pretty much every other deal since the deadline last summer, it doesn't feel like the Reds messed up the timing on this one. If the Reds weren't going to extend him--I was about 50/50 on whether that was a good idea to pursue--now was almost certainly the time to sell. Following two sub-par offensive seasons, Bruce finally rebounded, and thus far has turned in his best offensive performance since his age-23 season. There are questions about his defense, but those won't go away by the end of the year. One big month-long slump, however, could sap a lot of his value. We'll start with Bruce and then talk about the return he provided from the Mets. I don't think I can really do justice to Bruce here. He was the greatest Reds prospect I've ever seen. He was perfect in his 2008 debut. He clinched the 2010 NL Central Championship. Through it all, he was one of the most interesting, kind, and enjoyable players I've known in a Reds uniform. It's hard to think that we've likely seen the last of him in a Reds uniform. I'm going to be rooting like hell for him if he makes it into the playoffs. Now, what did the Reds get in return? 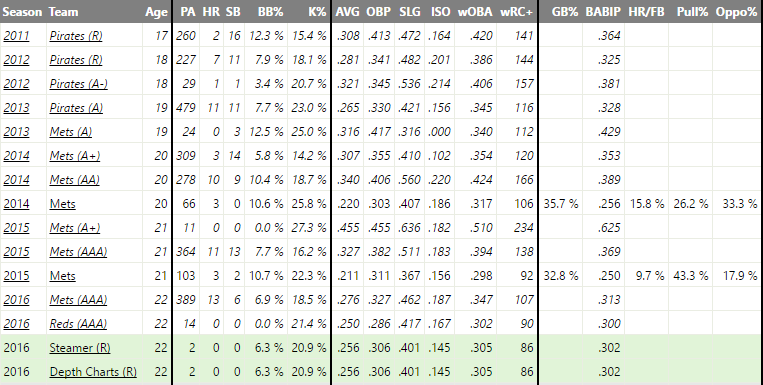 Herrera was an international free agent out of the Dominican Republic, Herrera somehow has managed to accumulate enough service time over the past two years to lose his "prospect" status, but he nevertheless has been hitting at the AAA/MLB level since he was a 20-year old. He's still just 22. Some eyebrows have been raised about his drop-off in performance at AAA this year, but to my eye he doesn't look much different. His strikeout rate is up a sliver, maybe, but his ISO is the same and his walk rate is virtually the same. The big difference is his BABIP, which is just .313 this year after clocking in at .369 last year. 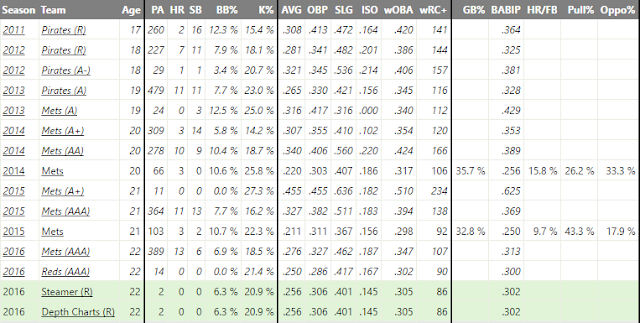 Eric Longenhagen projects him as a 50 Hit/50 Power player, which is awfully nice for a second baseman. His glove is apparently nothing special, even at second base, which makes me worry a little; if he turns out to be below-average, that puts a lot of pressure on his bat to provide value. Still, you have a 22-year old with prospect pedigree with parts of two seasons at the major league level along with good power. That's a nice piece, and seems a good return for a half-season of Jay Bruce to me. Wotell was a 3rd-round pick in 2015, and has been used as a starter this year after pitching as a reliever last year. Eric Longenhagen's scouting report on him cites good velocity (up to 94 mph) and a good breaking ball. If he learns a change-up, he might be a starter. If not, he could be a LOOGY arm. He's barely thrown any innings yet, but at least he's striking guys out. His walk rate was bad last year, but has been under control this year. He's young; a lot could still happen with him, good and bad. Thumbs up on him as an add-on. This seems like a pretty good deal for the Reds. I'm not sure where they'll put Herrera while they wait for the Brandon Phillips train to finally reach its final stop. The astonishingly foolish relegation of Jose Peraza to the bench for almost two months provided that Bryan Price won't bench Phillips, even when he is injured. But whatever. The Reds should be in talent-acquisition mode, and that's exactly what this deal is about. The Reds swapped a player who was likely at the peak of his near-term value (at least) for a guy or two who might help the next time. It's a good deal, just not a fun one. That's probably why it took me so long to write this. I'll miss Jay Bruce.